To view our First Quarter Contract which includes all assignments and in class Writing Prompts, click here. Chapter One: 1)What is the problem that begins the story? 2)How do Darry and Sodapop treat Ponyboy differently? Chapter Two: 1)Johnny gets beaten up badly. How does Cherry react to Ponyboy's story about the beating? 2)How does Johnny change after getting beaten up? 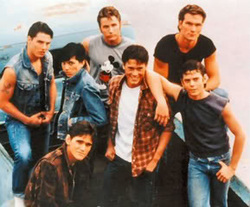 Chapter Three: 1) Who has more direction in life, the Greasers or the Socials? Explain why. 2) What happens to make Ponyboy want to run away? Chapter Four: 1) Why do Ponyboy and Johnny run away after the murder? 2)Why does Dallas help Ponyboy and Johnny after the murder? Chapter Five: 1) Why do their haircuts upset Ponyboy and Johnny so much? 2) Why do you think Hinton includes the Robert Frost poem, Nothing Gold Can Stay? Chapter Six: 1) Why do Ponyboy and Johnny run into the fire to save the kids? 2) What does Ponyboy say when he is asked by the teacher if he is sent from heaven? Why does he say that? Chapter Seven: 1) Why does Sandy move to Florida? 2) Who is Randy and why does he want to avoid the rumble? Chapter Eight: 1) Why doesn't Johnny want to see his mother when she comes to the hospital? 2)Why can't Two Bit and Ponyboy get along without Johnny? Chapter Nine: 1) Why do the boys claim to be hoods and menaces to society? 2)How has Dallas changed since the beginning of the story? Chapter Eleven: 1) Why does Dallas want the police to shoot him? 2) Why does Ponyboy say he was the one who killed Bob? Chapter Twelve: 1) How has Ponyboy changed since the beginning of the story? 2) What theme is revealed in Johnny's letter? Final Question (1 paragraph): Is it possible to "Stay Gold"? Explain your answer. For your final project which will equal one quarter of your grade, you can do a Book Reflection on "The Outsiders" or "The Afterlife" or take the Final Exam or write a One Act Play. The guidelines for the play are explained in the Webquest below.